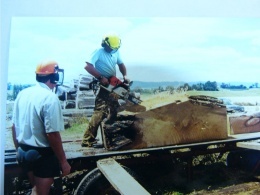 Early days of breaking down huge kauri pieces on the Vartag mill and completing the cuts with the chainsaw. 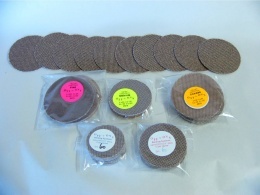 Sample discs of the ever popular ‘Astra’ Velcro-backed sandpaper. Sandpaper especially designed to cater for the gum content in kauri. Treeworkx was established in 1997 after a partnership was forged between two friends, Ron Wallace-Wells and Graham Oliver. The two men combined their interest in working with trees and subsequent discovered the beautiful timbers available within New Zealand. They decided to sell woodturning blocks to the hobbyist community. 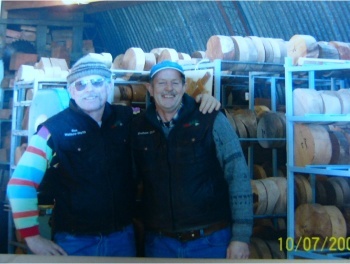 A few years later the duo acquired a sandpaper supply business known in the craft industry as "Off 'n' On's"
This sandpaper franchise allowed for a more complete service for New Zealand woodturners and exporting opportunities opened up for Treeworkx also. With the growing client base of the New Zealand Woodturning Association members the men travelled to shows and demonstrations throughout the two islands presenting their products. After thirteen years of trading on the circuit and satisfying many thousands of keen hobbyists Ron and Graham have split the business into two distinct identities within the Treeworkx brand.